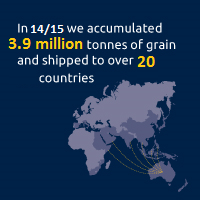 Emerald Grain is a trusted supplier of quality Australian grain to destinations locally and across the world. 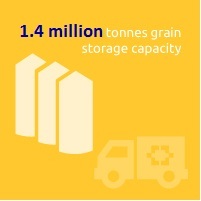 Emerald has the traceability, contract growing and quality segregation capacities which makes us a unique partner for grain buyers. 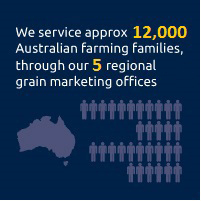 Through our network of local brands, joint venture partnerships and storage facilities, Emerald has ties with around 12,000 of Australia’s farming families and can source grain from every key grain growing region. Emerald’s integrated supply chain combined with strong shipping arrangements allows us to export from all states and from over 17 port terminals around Australia. These factors provide Emerald and its customers with security of supply and protection from regional weather and seasonal conditions. To see the full extent of Emerald’s national and international reach, view our Emerald network map. Emerald offers customers access to a full range of grains including high quality milling wheat, malting barley, food grade pulses, oilseeds including canola and feed grains including sorghum, maize, feed barley, oats and lupins. Emerald has the capability to work with farmers to develop niche segregations grown to meet specialised product requirements. Emerald has developed an integrated supply chain in South Eastern Australia that stretches from the farm-gate and includes up country storage, railways, road transport and port facilities. Elsewhere Emerald has developed alliances and strong logistics and shipping arrangements that allow us to export from most grain terminals across the country. Emerald exports in bulk and in containers, with a range of qualities and shipment sizes sold and executed for destinations throughout Asia, the Middle East, Pacific Rim, Europe and Africa.